It's fair to say that baby boomers Steve Kusmer and Kevin Wallace have spent some time together. The founders of San Francisco-based app development firm Abvio met while working at Hewlett-Packard in 1983--their first jobs out of college. Later the pair worked together again at web development software company Macromedia. When, in 1998, Kusmer co-founded Atomz, a search engine for websites, he quickly brought Wallace onboard. Not long after Kusmer sold the company in 2005, they got the itch to start something new. "We asked 'What are we going to do now?' We build products and we like having a market tell us what it thinks of our artwork," Kusmer says. The canvas that Kusmer and Wallace had in mind was the iPhone. They were impressed with the complexity of its technology, including its processor, screen, GPS, earphones, speakers, accelerometer and gyroscope. As the two discussed possible opportunities within the exploding iPhone app market, they started looking more closely at their own lifestyles. They decided to capitalize on their mutual interest in fitness, and they believed the rich features of the phone were a perfect complement to an application designed for monitoring the exercise habits and progress of runners, cyclists and walkers. Leaning on their extensive engineering and product development backgrounds, the two spent a year in development. 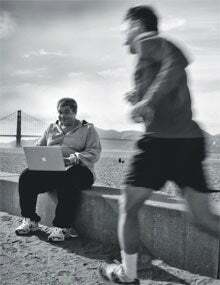 In 2009 they launched Abvio's suite of apps: Runmeter, Cyclemeter and Walkmeter. Now all three apps are in the top 30 grossing Health & Fitness apps in the iTunes App Store and more than 120,000 people used Abvio apps in March alone. During nearly three decades of launching successful tech platforms and applications, Steve Kusmer and Kevin Wallace have learned a thing or two about what it takes to grow fast. Here are four lessons that helped Abvio shoot to the top of the more than 350,000 iPhone app developers. Even though Abvio's three apps are big successes, Kusmer and Wallace have no immediate plans to create more. Instead, they're focused on constantly improving their current offering and looking for new ways to maintain customer loyalty and engagement. Kusmer and Wallace start each day with customer support services, reading what customers have written to them and answering every single e-mail. Abvio has grown without adding expensive real estate or staff. The company runs with two principals and six consultants, who are hired to beef up specific skill sets on an as-needed basis. Fast-growth companies require dedication and long hours, so it's important to love what you're doing. From the beginning, Abvio took a focused approach that differs from many other developers. The price point for each app is $4.99, with no free or "lite" versions. Although some considered it a risky move, Wallace and Kusmer decided to stick with an iPhone-only app instead of developing additional versions for Android, BlackBerry and Windows 7 platforms. They felt it would slow down improvements. "We have competitors who spread their efforts over websites and multiple smartphone applications--it slows their innovation to a crawl," Kusmer says. "They have to make sure everything works across every platform, and it slows development to the lowest common denominator of the platforms they're addressing." Abvio is entirely bootstrapped. They sought no outside investment and credit word-of-mouth as their primary sales-driver. The guys hired a freelance public relations consultant shortly after they launched to generate publicity as a means of marketing, and they use social media and a blog to spread the word about their apps. As the business has grown, they've hired six additional consultants to assist in the development of specialized app features and to help with marketing and PR. But they have deliberately stayed lean, rather than staffing up right away. "When you're building a company, you can choose the venture capital route or you can choose the venture profitable route," Kusmer says. "We've built both kinds of businesses and the minute you raise a dollar in venture capital, your job becomes turning that into $10." Instead, Wallace and Kusmer have focused on providing "enormous value" to their customers. Suitable for the hard-core athlete or weekend warrior, Abvio's apps provide users with the ability to track their entire excursion. The apps also generate progress graphs of runs, walks and cycle routes that can be exported to Google Maps to see 3-D views of the trip. Up next: Adding support for sensors that monitor heart rate, speed, cadence and bike power. These features, which will be available by the end of the year, will replace existing--and more expensive--devices important to serious athletes by supporting simple sensors that are already available on the market. "Our little company that sells a $5 app is replacing the $500 bike computers out there, with far more capability," Kusmer says. "We're really excited, because we like to win."